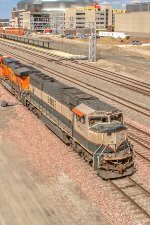 Description: BNSF southbound coal train running on track 2, due to crossing replacements on track 1. Description: BNSF 9826 is the second enigne on NS 224. Description: northbound NS 733 on track 2 at Rauchenburg Rd. Description: Three executive scheme SD70MAC's bring a westbound hopper train through Lake Park. Description: Northbound coal empty reaches the summit of Rich Mountain. Description: Coal load eases down the main between switches at Waldron on the BNSF St. Joseph Sub. Description: CP empty coal train 811. Title: And Now for Something Completely Different! Description: A change in location moves us to downtown Fargo, where these two locos are waiting for permission to enter Dilworth yard.